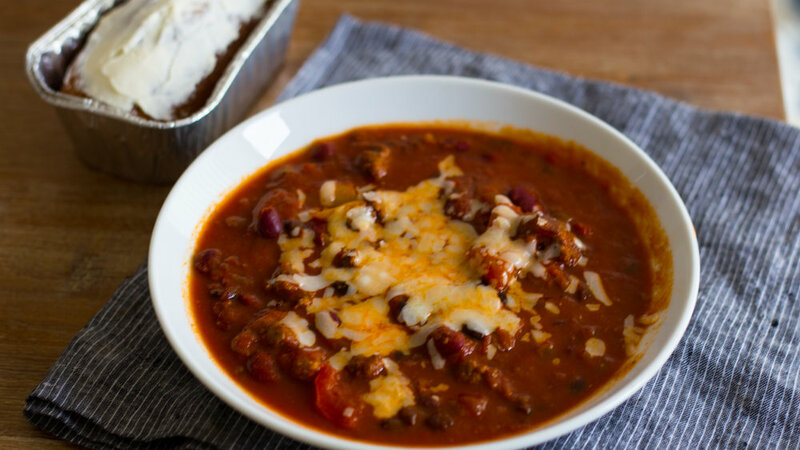 Bison Chili w/ Pumpkin Loaf & Cream Cheese Icing — Happy Food Co. EMPTY contents of olive oil packets in a large stockpot over medium-high heat. ADD the onion and bell pepper and sauté until translucent, about 5 minutes. ADD the bison and cook until completely browned. STIR IN garlic, chili seasoning and cumin. RINSE kidney beans and black beans in colander. MIX beef broth concentrate with 1 cup hot water in liquid measuring cup. ADD the beef broth, tomatoes, BBQ sauce, hatch chiles, kidney beans and black beans to stockpot. Stir to combine. BRING the chili to a boil. REDUCE heat to medium-low, cover with lid and simmer for 20 minutes. Season to taste with salt and pepper. STIR sriracha sauce into your chili for an extra kick of spice and top with sour cream and cheddar cheese, if desired. SERVE chili with pumpkin loaf slices on the side. Enjoy! ★TIP : Please recycle your dinner kit packaging. Our containers are compostable and made from plant-based materials. Layered with hints of rich blackberry, luscious caramel and smooth toasted oak, this wine is an exceptional complement to your favorite red meat.